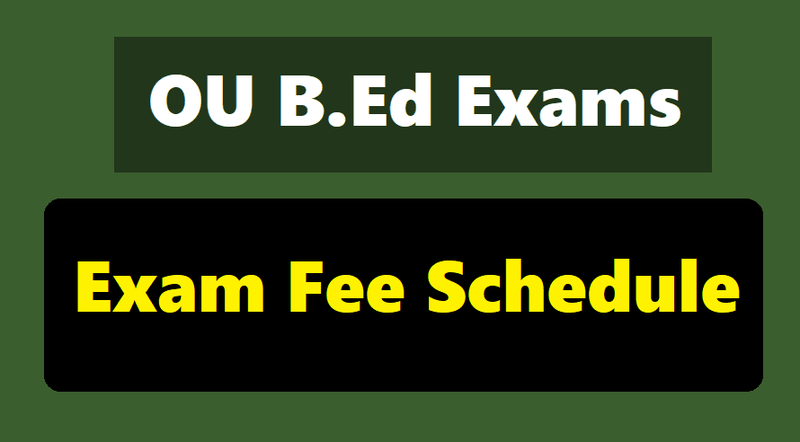 OU BEd Annual Exams Fee due dates 2018 notification / OU B.Ed Annual Exams 2018 Notification BEd Regular, Backlog Exams 2018 Notification: Controller of Examinations, Osmania University, Hyderabad has issued OU B.Ed Annual Examinations 2018 notification, This notification details as follows. B.Ed Exams Fee Due Dates 2018 Notification: It is hereby notified for the information of all concerned that the B.Ed Annual Examinations for the Academic Year 2018 Regular, Backlog Batch candidates. They can appear Theory along with Practical Examination under the Jurisdiction of this University. The detailed Time-Table and Hall-ticket will be made avilable in due course. Last date for payment of Examination fee Thursday and submission of Examination Application forms: 07-03-2018. It is hereby notified for the information of all concerned that the B.Ed. Supplementary Examinations (Backlog candidates of 2012-2013, 2013-2014 and 2014-2015) can appear Theory along with Practical Examination under the Jurisdiction of this University will be held in the month of March 2018. The Time-Table will be notified in due course. 1. Remittance of consolidated Examination fee to the Registrar, Osmania University Exam Fee Fund A/c No. 52198262033. THIS IS THE LAST CHANCE FOR 2012-2013 & 2013-2014 BATCH BACKLOG CANDIDATES & THEY HAVE TO PAY RS.1,000/- PER EACH PAPER ALONGWITH EXAMINATION FEES. 1. The Examination Application Forms (EAF) are to be submitted online through college login. Also, hardcopy of the same may be downloaded and submitted to the Examination Branch duly signed by the student and the Principal concerned along with photocopy of qualifying examination (user manual is enclosed). Xerox Copies of Examination Application Forms & photographs will not be considered. 2. The Principals are requested to pay the examination fee for received application forms and not to pay the fee for un-received application forms. Any excess fees for un-received application forms is not refundable Individual demand drafts submitted by the students will not be accepted. 3. The Principals are requested to verify and forward all the Application forms immediately along with the Name List (Nominal Roll) in prescribed proforma, subject-wise data & fee particulars in duplicate. (ii) The College Principals are requested to deposit (credit) the consolidated Examination fee amount into “Registrar, Osmania University, Examination Fee Fund A/c No:52198262033” in any Branch of State Bank of India and obtain a receipt from the bank and submit the same to the Examination Branch, OU along with application forms. 6. No Examination Application forms will be entertained after the due date 09-03-2018. 7. The Colleges are required to enclose the clearance certificates issued by the stores section of the Examination Branch as a proof for the unused examination stationery returned by the college pertaining to the examinations conducted earlier. 8. The Principals requested to submit the Application forms at the earliest possible date without waiting for the cut off date and furnish the details in the given proformas. when is the results of b.ed jul/august 2015???? when is the result of b.ed jul/august 2015??? ?